My husband and I recently bought two chaste trees at a local nursery, and were dismayed to realize they were the worst root-bound plants we have ever seen. They are only about a foot and a half high, but are much more root-bound than an apple tree we bought that was over half again our height. The roots are solid hard like a brick, even after soaking them more than an hour, and massaging does no good to soften them. I even began doing vertical cuts, but it did not loosen up the roots at all. so now I'm wondering should I cut them very deep to loosen them up and risk killing it, or let it stay root bound and risk letting it die that way as it continues to strangle itself? It is very common for Chaste Tree to be tight roots or root bound as you describe. To remove your chaste tree from the nursery container it was growing in, firmly grasp the tree or shrub by the base of its trunk and try to gently lift and remove it from its container. 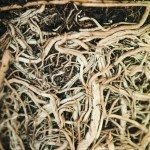 If the root ball is stuck in the container either cut the container away or place the plant on it's side and tap on the side of the container to loosen the root ball. After having removed the plant from the container, use your fingers or a claw tool to loosen some feeder roots around the surface of the root ball. If root bound, you can spray the sides and bottom of the root ball with a stream of water from a garden hose. This will help to wash away some soil from the exterior of the root ball making it easier to loosen roots. Set your chaste tree in the planting hole so that the top edge of the root ball is at or slightly above ground level. If necessary, add some backfill soil mixture to the bottom of the hole to achieve proper planting height.